The first documented record of the Bullmastiff was in the late 1800's. Large estates were having major problems with poaching on their land and they needed a dog to subdue the poachers. The Bulldog and Mastiff were cross bred to produce a large dog that would wait patiently for the poacher to arrive and then attack on command. 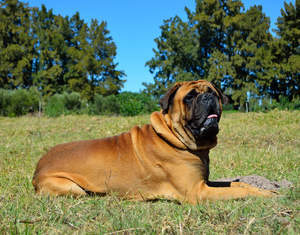 The Bullmastiff would not harm the poacher, but would simply hold him there, waiting for the land owner. They are known as the 'Gamekeeper's night dog'. 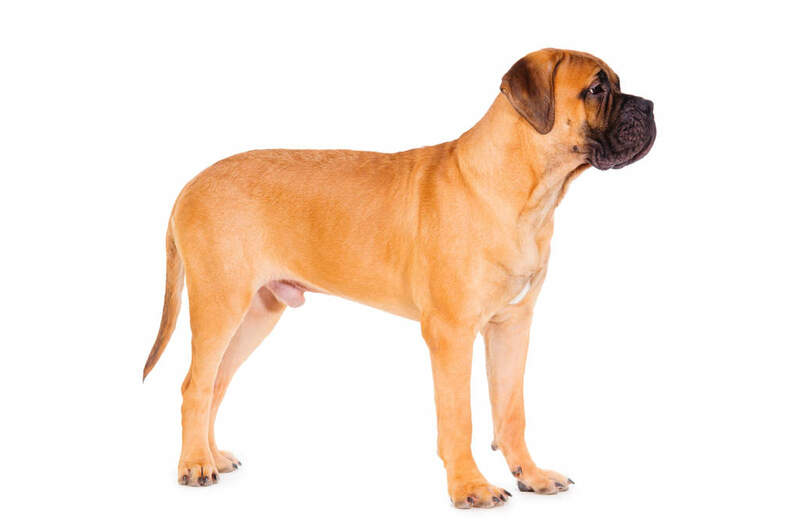 Breeders continued to cross until they found the ideal dog - 60% Mastiff and 40% Bulldog. They were first registered with the English Kennel Club in 1924. Bullmastiffs are a loyal and docile breed, craving human company at all times. They simply love being part of a family and are wonderful with children if raised with them. 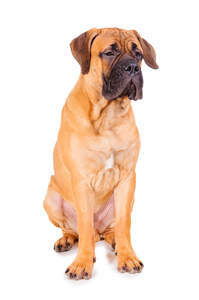 They are gentle giants around the home and will follow you to the bathroom, kitchen and anywhere you want to go. A breed that will want your love and cuddles and to sit on your lap whenever possible. They are guardians by nature and can be protective of those within the house. It is vital to introduce them to lots of strangers when they are puppies to prevent future problems. They produce vast amounts of slobber. Training of this breed is tricky as they dislike being taught by repetition. They are stubborn and independent, but need a firm-ish hand when it comes to training. They are strong, yet sensitive, so consistency is the key. Mixing up the training with play, commands and cuddles is the best thing. Asking them to lie down, over and over again will not work. 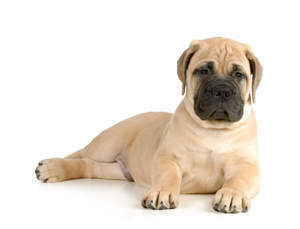 Due to their temperament, Bullmastiffs will guard your home and those in it. Early socialisation is much more important than with other breeds as they can be docile one minute and some can be aggressive the second someone comes in the door. They rarely bark unless they feel threatened, or think you might be in trouble. Males can be aggressive towards other male dogs, if not properly socialised. These are large heavy dogs and not for the timid owner. You need to be the boss or they will take over and cause you problems. They need a decent walk every day, to keep fit, but this can be on lead or in a safe area. They aren't too demanding with exercise, but like the chance to run around and play (with you joining in would be ideal for them). 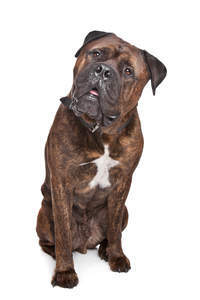 The breed does well in obedience training, agility and carting. They can suffer in hot weather, so need somewhere cool to sleep. They like a soft bed and if you don't provide one, you'll find them on your duvet. Brushing weekly will get rid of dead hairs, but generally coat care is minimal. 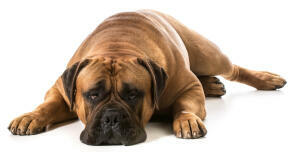 Gastric torsion (or Bloat) and Canine Hip/Elbow Dysplasia are more common with this breed. Bullmastiffs have a gentle and confident temperament. They make excellant guard dogs as they are very protective over their family. Around their family they will be gentle and quiet but once threatened they are totally fearless. It is important to socialise this breed in early puppyhood so they can learn to distinguish friend from foe and although they may put up with a pet cat they will not take well to intruders on their territory. 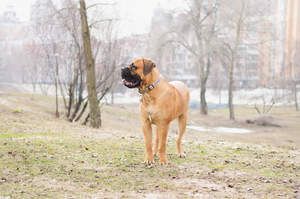 Health problems that may affect Bull Mastiffs include canine hip dysplasia (CHD), elbow dysplasia, bloat and cystinuria (urinary tract crystals that may need surgery to remove).